I have recently been notified that my neighboring SQL PASS Chapter Atlanta MDF will be sponsoring SQL Saturday 167 in Columbus GA. The Columbus GA SQL Users Group has been dubbed the “Extreme Southwest Atlanta Chapter” by Aaron Nelson (blog, twitter) For the past two years our two chapters have worked together in promoting and hosting two SQL Saturdays in Atlanta. Columbus GA is now having their first SQL Saturday on September 8th 2012. WordPress creates a unique link for each of your post. They are broken out with your URL then YYYY / MM / DD then what you are allowed to name your link. This is inconvenient when trying to reference back to yourself. Wouldn’t it be nice to have a shorter URL with your blog name in link verses publishing a TinyURL or some other shortening service. After a little bit of research I found such a way. You have to create a new page on your blog and can keep the page private, then simply post the code below but make sure to change the “redirect_to_link” to the page you want to redirect your viewers to. You can name the page your short URL. Go ahead and visit http://timradney.com/IOPS it will redirect you to http://timradney.com/2012/07/06/iops-verses-throughput-measuring-performance-of-your-storage/ Which would you rather type? I am not one of these anti PC sorta guys, but I do love my MacBook Pro. I have owned a PC since 1993 when I got my Packard Bell 386 with Windows 3.1. Even with my MacBook I have 9 Windows flavored VM’s on it. To be honest, I have never had Windows run better than as a VM on my MacBook. Due to having so many VM’s the 8 GB of ram I had just didn’t cut it on some occasions. With wanting to dive more into Windows Failover Clustering and wanting to experiment more with SQL 2012 and “Always On” I knew I needed a bit more horsepower to do all the playing and studying I want “need” to do. I posed the question to a superior and got the green light to make a modest increase in memory. 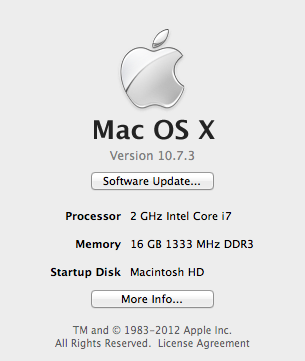 I can not wait to put this 16 GB of ram to the test. Next I hope to get a Thunderbolt enclosure with an SSD to put a few VM’s on. 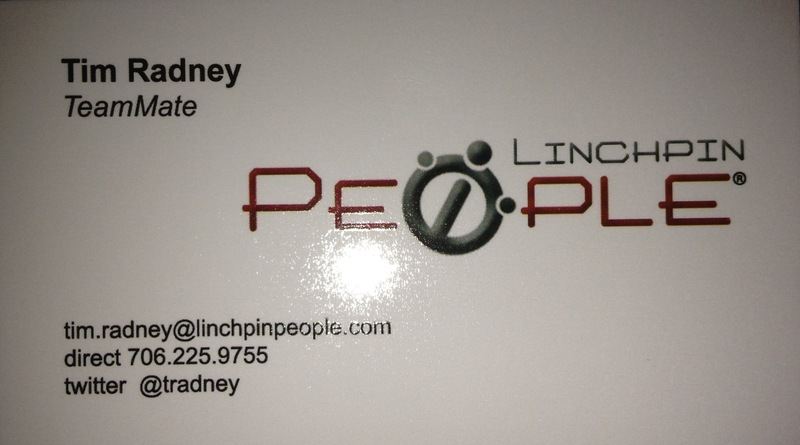 It was announced publicly this past weekend at SQL Saturday #111 that I have joined Linchpin People as their first teammate. My friend Andy who is also a Chief Servant Officer of Linchpin made the announcement during the speaker dinner and gave me an official Linchpin dress shirt. During the remainder of the speaker dinner and throughout the SQL Saturday event the next day people kept asking me about Linchpin. I would explain to them the culture of Linchpin and tell them the short story of how it came to be that I was joining such a great outfit. The primary question I kept getting was ” Are you joining Linchpin full time as a consultant?”. I had to explain that I was only doing so part time at this point in my career. (Night and weekend type work) I would then explain my current job and what all has happened with me in the DBA role over the past 4 years. I was recently promoted to a lead role and have 4 DBA’s that I am responsible for including mentoring and helping them grow in their career. My current job is wonderful, I really enjoy the folks I work with and have numerous really cool projects going on. I started the side business primarily to make a few extra bucks to help fund trips to SQL Saturday’s. I really enjoy getting to travel around the country speaking and teaching others what I know. I also get to learn a great deal from attending other sessions and networking with the SQL Community. In forming my LLC, this awesome opportunity arose with Linchpin. How could I possibly say no to working with Andy Leonard, Brian Moran, Mike Walsh and Robert Pearl. It is really nice being the team lead at work, but it is even better being the dumbest guy in the group with Linchpin. There is so much for me to learn from these guys. I am really looking forward to absorbing as much as I can from each of them. In recent months I have been asked to ensure we are auditing both successful and failed logins, not just failed logins. It is simple enough to open SSMS, connect to the instance, right click on the server, chose properties, click on security and then check the proper radio button. When putting together or most recent updates to our server installation guide I decided to spend the few minutes to research how to make this change with few steps. In my case I need this to be both failed and successful logins. I will execute the following code within SSMS. Recently I learned that you can and probably should increase the number of SQL Server Error logs that your instance of SQL Server maintains. This is real simple to change. You can make the change via the GUI with a few simple steps or accomplish it with TSQL. To make this change with SSMS, open SSMS, connect to your instance, expand Management, right click on SQL Server Logs and chose Configure. You can then check the box “Limit the number of error log files before they are recycled” and increase the number from 6 to any number up to 99. Using TSQL you can execute the following statement to increase to 99 files, simply change 99 to how ever many files you would like to retain. This morning I was working on getting all new inherited SQL Servers patched to current levels of service packs when one particular server was failing on patching the database engine itself. A quick google search revealed articles tips that someone may have deleted the c:\windows\installer contents. That wasn’t my case. After reviewing the summary.txt file in the “setup bootstrap” folder I noticed that it was failing because it couldn’t write to \SQLDATA\\MASTER\328C400…. Notice the path, there are two back slashes before MASTER. Can we say typo? I corrected that in the default path and reran the SP installer for Database Services only. Problem was solved. Not a bad find for 4:30 AM after working all night.